Is your website displaying correctly on mobile and tablet devices? If not you could be losing a ton of website traffic. We’ll take your website and make it Responsive, meaning it’ll display properly on all types of mobile and tablet devices, keeping your website visitors happy. Having a mobile version of your website is essential today! Year on year more and more people are using mobile devices and tablets to access all sorts of websites, yours included, in fact in recent years mobile has taken over as the main way consumers access the internet. So, how do you get a mobile version of your website? 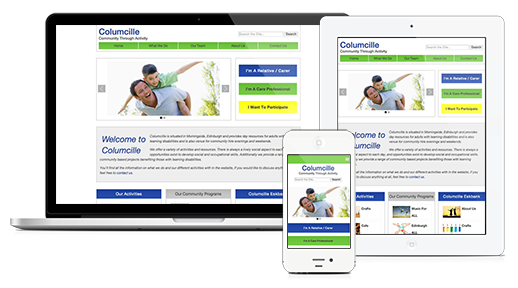 By far the easiest, cheapest and most effective way to create a mobile version of your website is option 1, Responsive Web Design. Responsive web design is the process of creating a mobile website from an existing website, without having to design a mobile site from scratch. This is done by changing the layout of the website as the screen size gets smaller. For an example of this have a look at the image above, which shows a responsive website. A quick way to test to see if your website is already responsive is to adjust the width of your browser window. As you reduce the window size you’ll see the layout change if your existing website is already responsive. If you find it’s not, it’s probably time to think about making it responsive, you’d be amazed a how much traffic you could be losing because of this. Contact Us or give us a call on 01505 427227, the first step to creating your mobile friendly website.